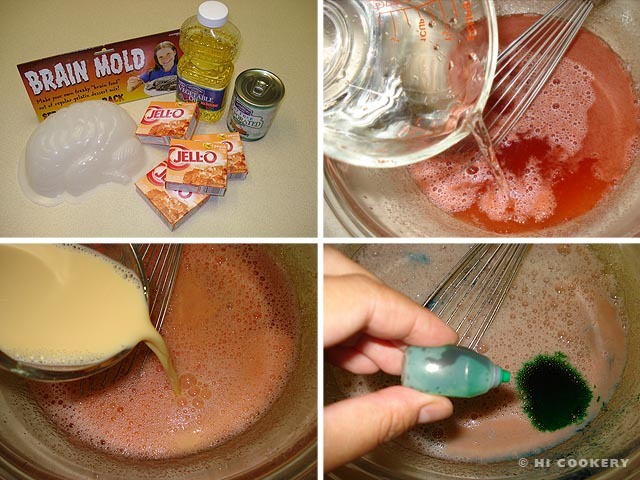 Gross out your guests when you gather together during the month of Halloween! 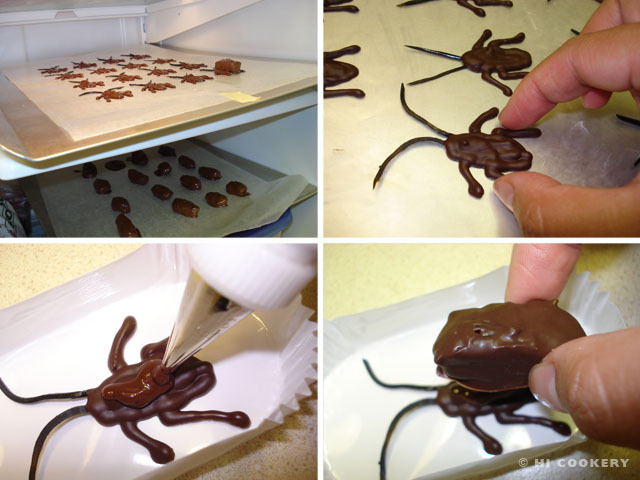 Serve up some creepy critters we call “choco-roaches”! They look like chocolate-covered insects but they are really chocolate-covered dried dates with eerie innards of white frosting and nut chips. The string licorice antennae add disgusting details to the dates. 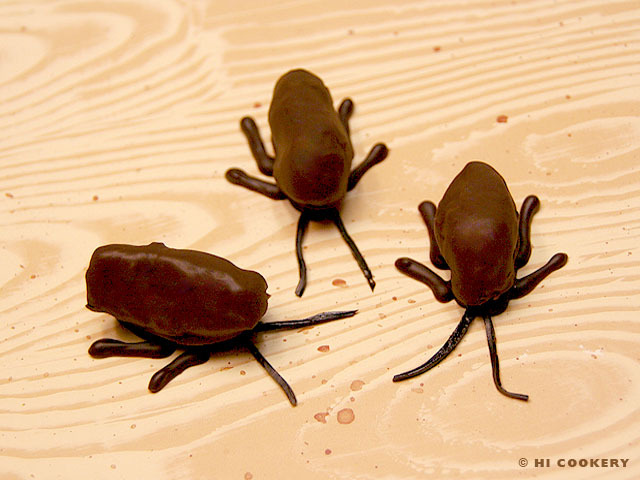 Instead of eating real roaches for National Chocolate-Covered Insects Day, chew on “choco-roaches”! Slit open the dried dates. Using a small round tip, pipe white frosting inside. Tuck in a few nut pieces. Close the dates and set aside. 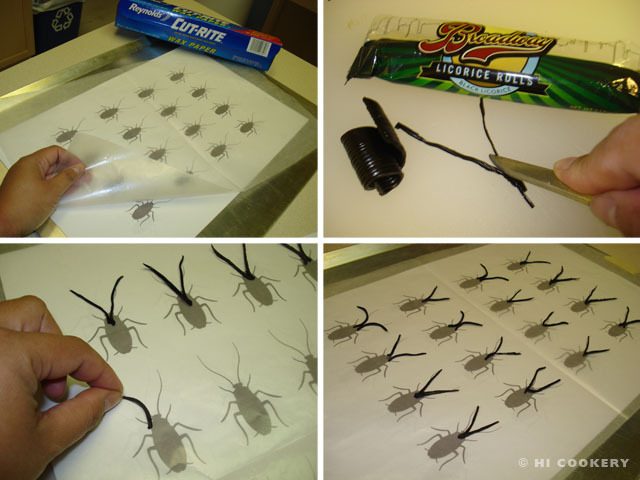 Print out a template of a cockroach clip art. Place under waxed paper on a cookie sheet. Slice the black string licorice thinly to make antennae. Position them on top of the waxed paper. Melt the chocolate and fill a pastry bag with a small round tip. Trace over the cockroach clip art, filling in the body and incorporating the antennae. 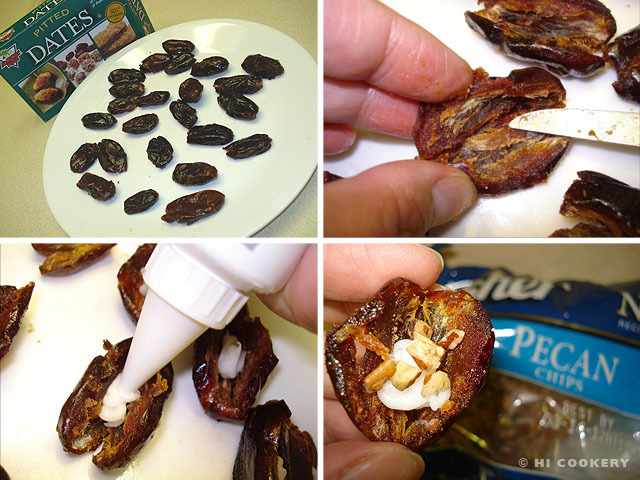 With the lefttover chocolate, dip the dates until coated. Place on another cookie sheet lined with waxed paper. Refrigerate both cookie sheets until the chocolate is chilled and set. Carefully remove the flat roaches from the cookie sheet and place on a treat liner or plate. Pipe melted chocolate on top of the body and “glue” a chocolate-covered date on top. Refrigerate to set. Serve chilled or at room temperature. Some cultures consider insects a delicacy, whether plain or chocolate-covered. 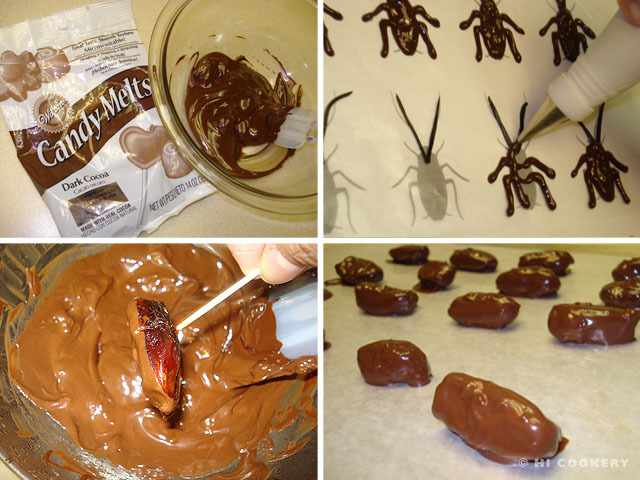 An easier version of “choco-roaches” would be to eliminate all the ingredients except the chocolate, which could be melted and piped into cockroach shapes. They are flatter but still freaky! We serve our “choco-roaches” in individual rectangle treat liners sold by Wilton. Search our blog for more gross-looking goodies for Halloween. 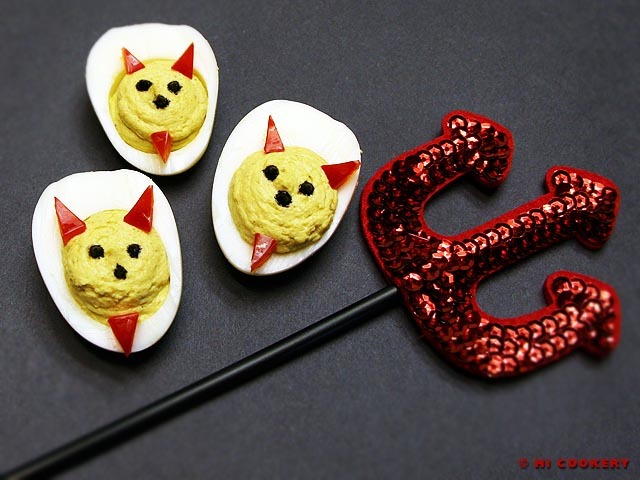 We dress up deviled eggs for Halloween dinners and make them a little hot and spicy with curry powder and red bell pepper. The added appeal of these appetizers is that they are made with healthier ingredients, such as fat-free yogurt instead of mayonnaise and a crisp, fresh vegetable for a garnish. For an “eggs-traordinary” presentation, prepare curried devil’s eggs for National Deviled Eggs Day! Boil, cool and shell the eggs. Slice the eggs in half lengthwise. Carefully remove the yolks and place in a small bowl with the yogurt, curry and salt. Mash together with a fork until smooth. Fill the egg whites with a mound of the yolk mixture (we used a pastry bag fitted with a large round tip). Slice the red bell pepper into a long strip. 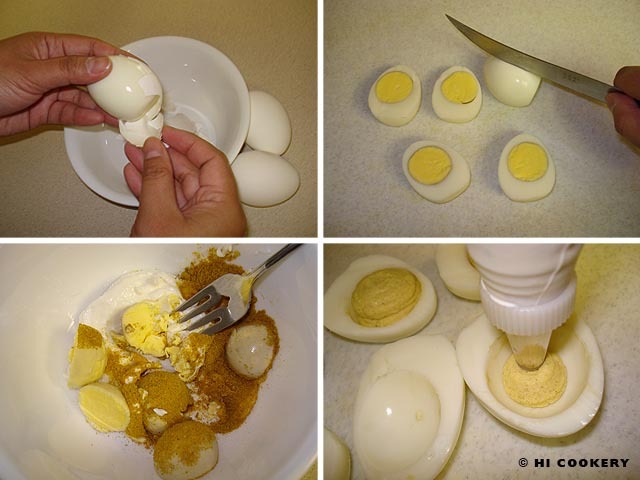 Cut out tiny triangles and arrange on them on the egg. 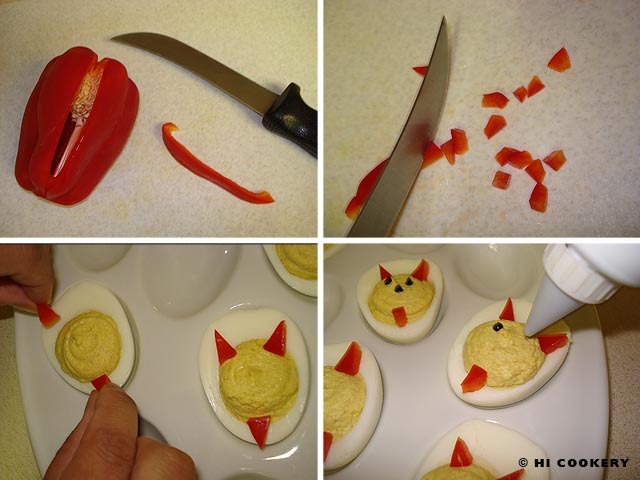 To make the devil’s horns and beard, use two red bell pepper triangles pointing up on the wider end of the egg and another one pointing down on the opposite side of the egg. Lightly touch the tip of the black tube frosting to make the eyes and nose. Refrigerate until ready to serve. Knead the black tube icing and squeeze out the excess liquid on a napkin before decorating the curried devil’s eggs to avoid runny smears on the yolk filling. 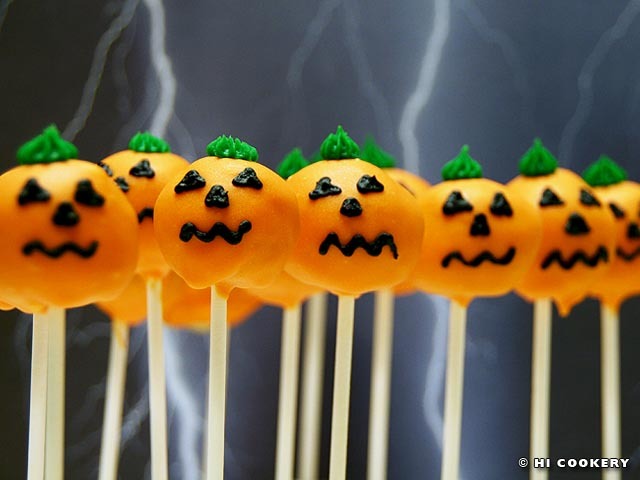 From food flops to our first cake pops, we transformed ugly muffins into pretty pumpkins! We were about to trash the cracked, overflowed tops that were stuck to the baking pans but were conscious about wasting food, time and effort. So we tried to salvage them by making one of the trendiest treats today—cake pops! After some trial and error (and a few more food flops that necessitated the creation of a separate blog page), we finally figured out a technique that worked for us (see Notes below). While they all don’t look like The Great Pumpkin, Charlie Brown, it seems like Jack’s crumbly cake innards have a good enough candy-coated costume for Halloween! Bake the cake, let cool completely and crumble finely into a large mixing bowl. 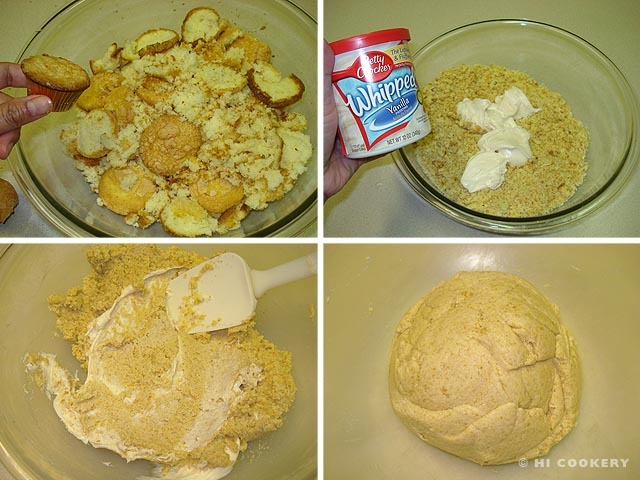 Dump the canned frosting into the bowl and mix well until smooth. Refrigerate for 30 minutes to firm up the mixture. 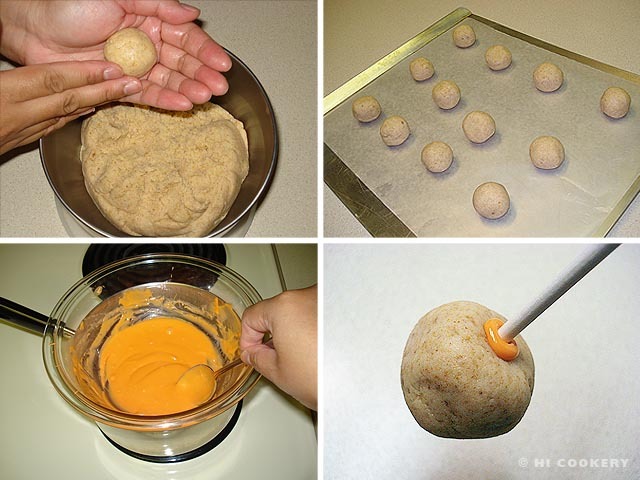 Scoop or pinch out 1 – 1 ½ inch of the chilled mixture and roll into balls. Place on a cookie sheet lined with wax paper. Refrigerate again to firm them up. Microwave the candy melts in a small bowl according to the package directions. Stir until smooth. Set the bowl over a pot of simmering water to keep it tempered. Dip the end of a lollipop stick into the melted candy. Insert it at least halfway into the cake ball. Refrigerate again to set the candy and secure the lollipop stick in place. Dip the chilled cake balls into the melted candy, working quickly to cover the surface. Allow the excess to drip back into the melted candy bowl. Stick into a styrofoam block in the refrigerator. Cool to set the candy coating. Pipe in the pumpkin face with black tube frosting. Crown Jack with a stem using the green tube frosting. Refrigerate until ready to serve. The cake and frosting may be made from scratch. We used a butter recipe golden cake mix for our first cake pop experiment but a pumpkin-flavored one would have been more festive. The frosting binds the cake crumbs well but we found it made the candy-covered cake balls even sweeter for our tastes, even though we used 2/3 of the canned content. Whipped cream cheese could be an alternative to frosting. Cake pops are best made when chilled, which is a challenge in warm kitchens with a hot flashing chef! Refrigerate (or freeze) them frequently between decorating steps. However, much like a hormonal imbalance, they do tend to “sweat” (the condensation happens when the outer candy coating comes to room temperature while the inside cake pop is still cool). Size does matter. 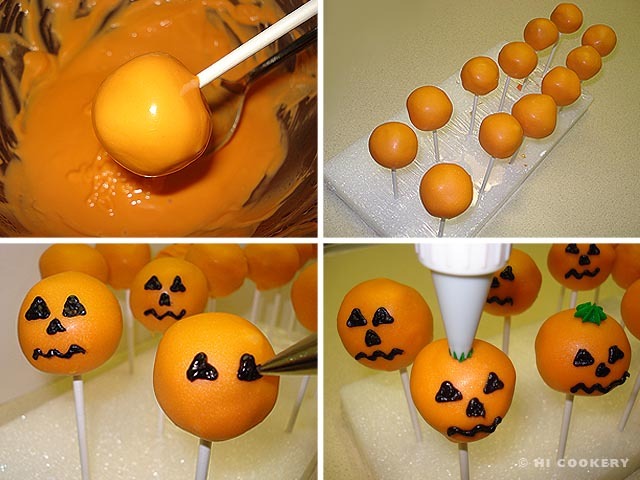 Big cake balls are heavy on the lollipop sticks and can slide through (see our Food Flops page). Roll them no larger than 1 ½ inches for a lighter and more manageable weight. A double boiler or fondue dish would temper the candy evenly and smoothly, unlike our first attempts to coat the cake balls when the candy “siezed” into a lumpy melted mess. Oh, Great Pumpkin, heed our wish list, which now includes a chocolate melting pot! Pre-poke the styrofoam block to make it easier to stick the cake pops during the preparation process. For a decorative display, wrap a Halloween ribbon around the base. Four-inch lollipop sticks are okay but six-inch lengths are better for handling. Serve them from a decorated styrofoam block or present them on a treat stand (which is also on our wish list). Handle the cake pops with care as they can crack! 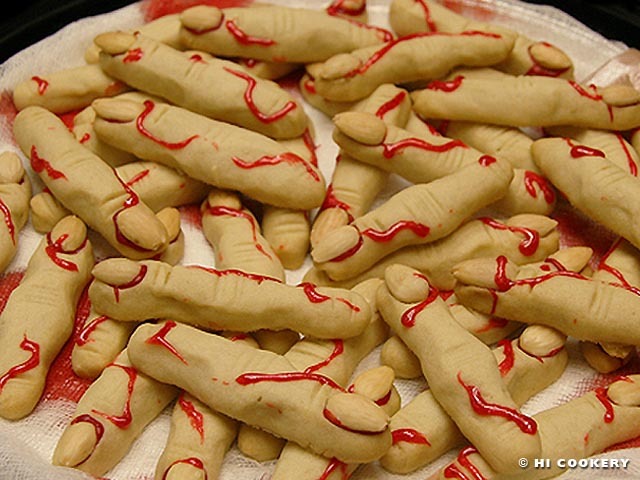 There is nothing lady-like about these freaky finger cookies as the dainty dessert gets a monstrous makeover for Halloween! These almond-flavored bloody biscuits look terrible but taste terrific. Friends look forward to us sharing these spooky snacks at social gatherings around this time of the year. 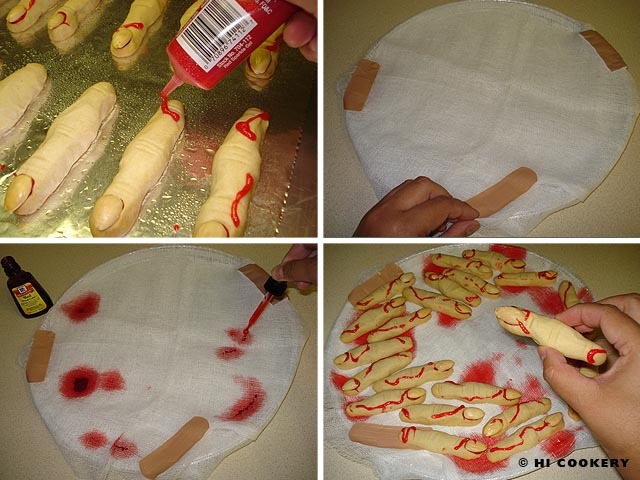 Trick or treat, these freaky finger cookies are good to eat! In a large mixing bowl, cream the butter with the sugar. Beat in the egg, almond extract and vanilla. Gradually blend in the flour and salt. 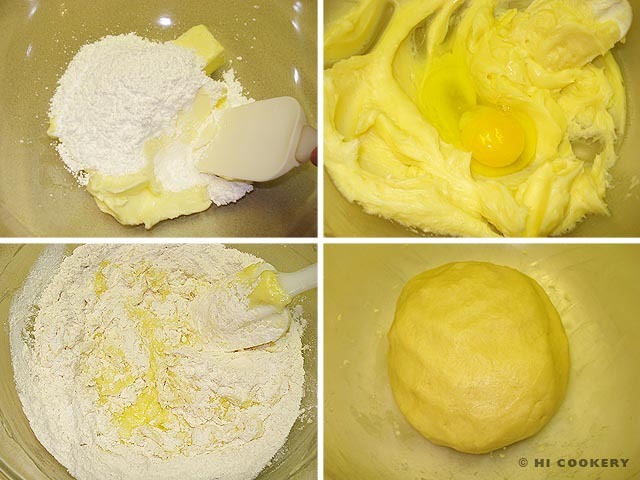 Mix the dough until smooth. Shape into a large ball and cover with a plastic wrap. Refrigerate for half an hour to firm up the dough. 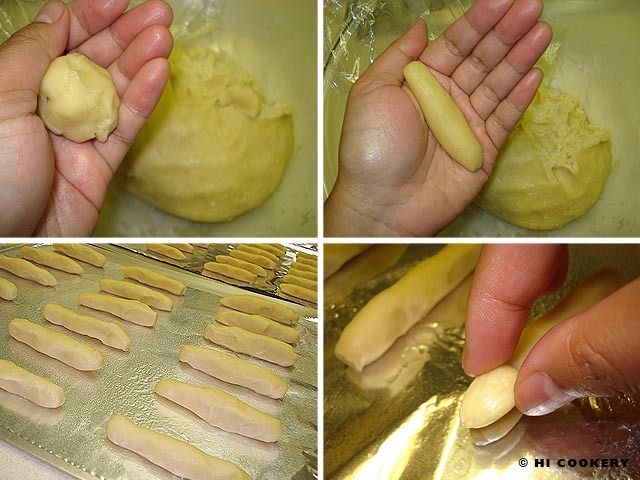 Pinch out about 1 ½-inch balls from the cold dough and roll them into finger shapes, leaving a few bumps and puffs for the knuckles. Place on a greased cookie sheet about an inch apart from each other. Add an almond on the tip of each cookie. Using a paring knife, make a few slashes to resemble the skin folds of fingers. Bake in a preheated oven at 375 degrees F for 20-25 minutes. Remove from the oven. While still hot, dab the red gel icing underneath the almond to secure the “nail” in place. Let the cookies cool to a crisp. Decorate with red gel icing. To serve on a bloody platter, line it with a cheesecloth or gauze and tape it down with bandages. Drop a few liquid red food coloring randomly on the fabric and let dry. Arrange the cookies on the platter and serve. Yield: 3-4 dozen cookies. We omitted the baking powder in the original recipe because the cookies kept puffing up and losing their slender shape in the oven. 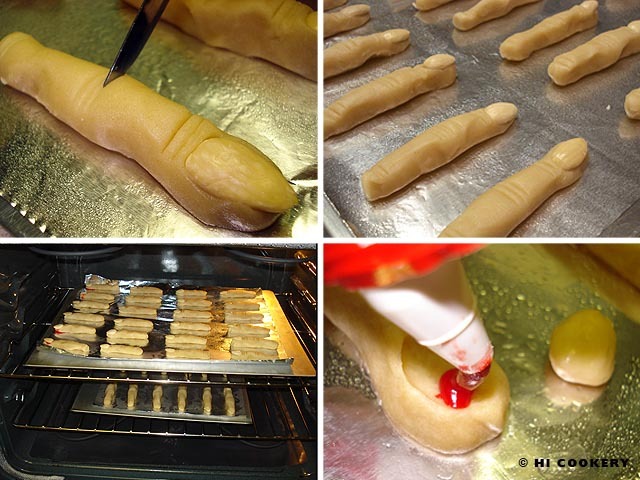 We also refrigerated the formed finger cookies for another half hour before baking. Blend in green food coloring to the dough before baking to make a wicked witch’s or Frankenstein’s monster finger cookies. Dr. Hannibal Lecter is our maniacal medical movie muse when we make a brain-shaped gelatin for Halloween parties and potlucks. The gross looking but great tasting gray matter always freaks out folks! What makes this festive, fat-free food more fabulous is that it does not require brain surgery to create something this creepy (although a specialized mold is needed for the operation). 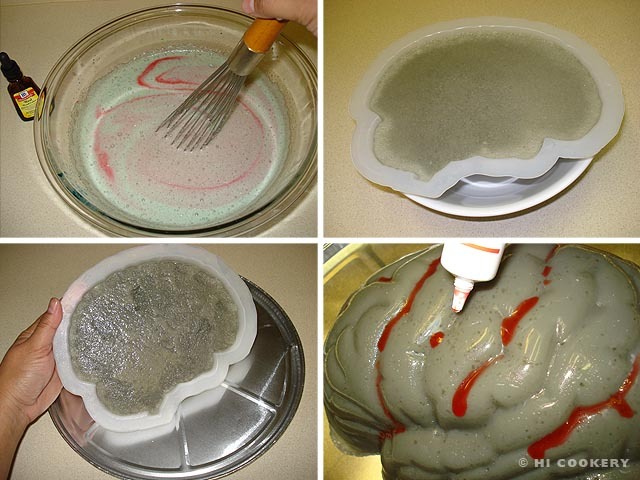 Simply set the solidified brain on a stainless steel or metal plate and drip bloody red gel icing in the wrinkles and folds for a freshly-extracted, neurosurgical presentation. Both cannibals and clinicians alike are sure to savor this sweet and smart centerpiece! In a large bowl, pour the boiling water over the gelatin. Stir until dissolved. Mix in the cold water. Add the milk and stir. Slowly put a few drops of green, blue and red food coloring until the desired shade of gray is reached. Pour into the lightly oiled mold about a quarter inch from the top. Place in a shallow bowl to stabilize the mold and level the contents. Allow the bubbles to settle slightly at room temperature for about half an hour before covering with a plastic wrap. Refrigerate overnight. Invert the gelatin onto a plate, shaking the mold gently to loosen if necessary. Decorate with red gel icing. Refrigerate until ready to serve. Slice off pieces with a scalpel knife. 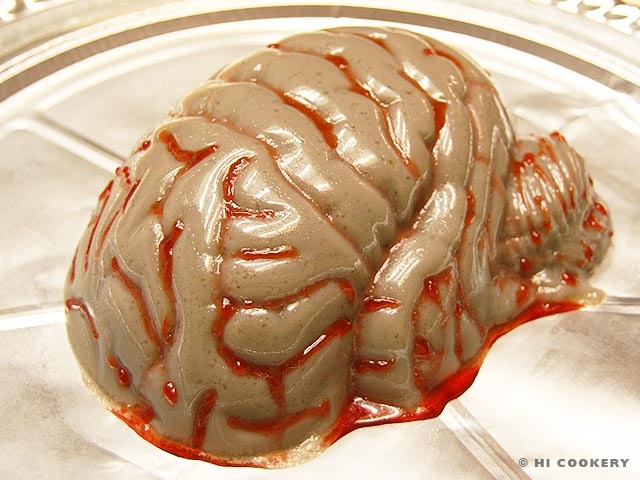 We purchased the brain gelatin mold from Archie McPhee novelties online store. They may also be available at seasonal retail locations, specialized Halloween shops or party stores. Brittle bones are scary if diagnosed with osteoporosis like Islander. 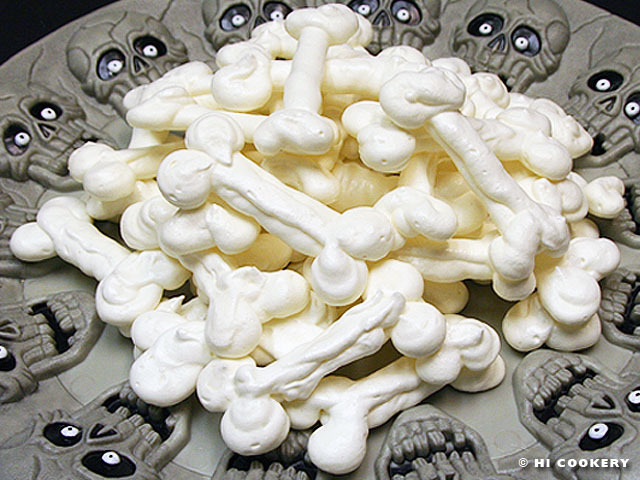 But ‘dem bones make for frightfully fun fat-free cookies for Halloween and All Souls’ Day/El Día de los Muertos (Mexicans celebrate the Day of the Dead on November 2). They also make for an incorrect but interesting anatomy lesson and an (incr)edible evangelization experience when discussing Ezekiel 37:1-14! 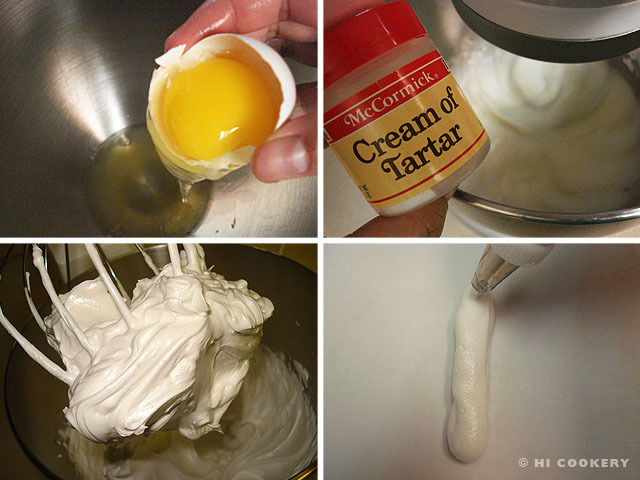 With a handmixer or in a stand mixer, beat the egg whites with the cream of tartar and pinch of salt until fluffy. Gradually add the sugar and continue to beat until shiny. Stir in the vanilla. Fill a pastry bag fitted with a large round tip (we used Wilton tip 10) with the meringue. Pipe 3-inch long bone shapes on top of a parchment paper-lined cookie sheet. Bake in a preheated oven at 200 degrees F for an hour. Turn off the oven and leave the meringues to dry for another hour. Remove from the oven and carefully peel off the meringues from the parchment paper. Store in an airtight container until ready to serve on a platter. 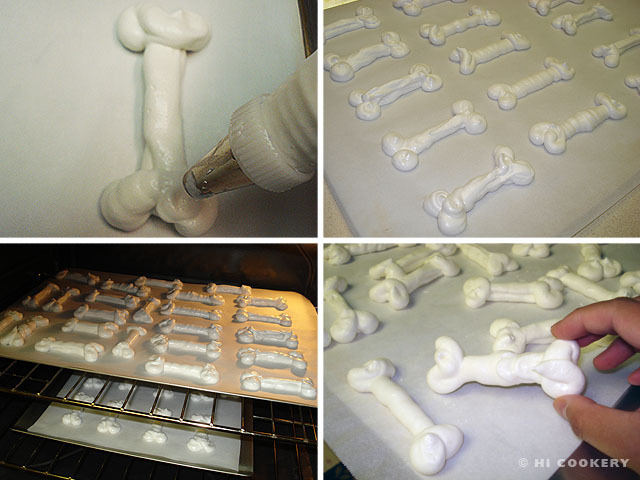 Yield: Approximately 3-4 dozen meringue skeleton bone cookies. Lyrics, music and video of the spiritual song “Dem Bones” or “Dry Bones” can be found on the Kididdles website. October 20 is World Osteoporosis Day. Please pray for those afflicted with this bone condition and support any research, education and awareness programs.